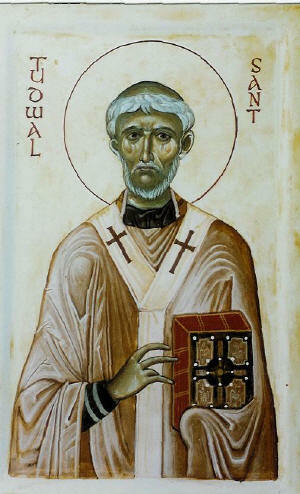 Saint Tudwal, or Tugdual, is known as one of the Seven Patron Saints of Brittany. The Welsh monk Tudwal was one of the sons of King Hoel I Mawr (the Great). He traveled to Ireland from his father's home in Britain to learn the scriptures before becoming a hermit on Ynys Tudwal (St. Tudwal's Isle East) off the Lleyn Peninsula in North Wales. He later immigrated to Leon in Brittany and settled at Lan Pabu with some seventy-two followers. Here he established a large monastery under the patronage of his cousin, King Deroch of Domnonee. From here, Tudwal traveled throughout Brittany evangelizing the local population. He founded the Monastery of Val Trechor at Treguier, which stood on the site of Treguire Cathedral, and had the foresight to go to Paris and have his land grants ratified by King Childebert of the Franks. Around this monastery the village of Minihy grew what was to eventually be the town of Treguier. The monarch insisted that Tudwal be made Bishop of Treguier where he is still venerated, especially around Leon. It was at Treguier that he died in 564. His shrine can still be seen in the Cathedral. 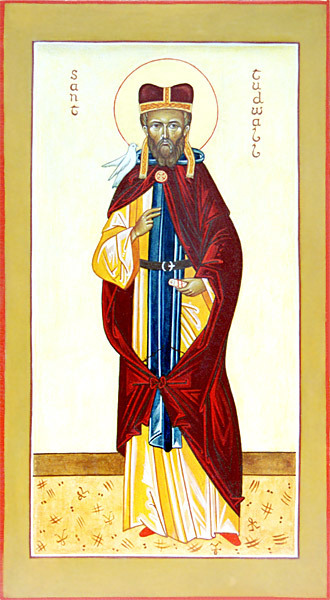 The largest portion of the body of Saint Tudwal has been preserved for centuries in Laval at the Collégiale Saint-Tugal de Laval, where they were translated in the ninth century.